The West Kent map (below left) shows the boundaries of parishes that formed the historical Diocese of Rochester, which is also the area covered by the Society's publication West Kent Sources, and the website Parish Gazetteer. 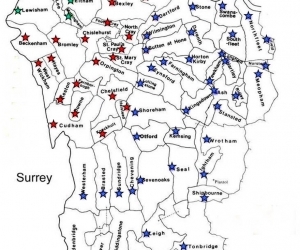 At the formation of the Society our area was defined as "South East London and western Kent". Thus we extend north to the river Thames and west to the original (pre-1889) Kent/Surrey boundary. This takes in those areas that were successively incorporated into London: first by the County of London in 1889 and the additional area that became part of Greater London in 1965. The Greater London area comprises the boroughs of Greenwich, Lewisham, Bexley and Bromley. The remaining area has always been part of Kent. In 1979 the Woolwich & District FHS was formed. We no longer have a formal boundary agreed with W&DFHS, so our various activities do sometimes overlap. 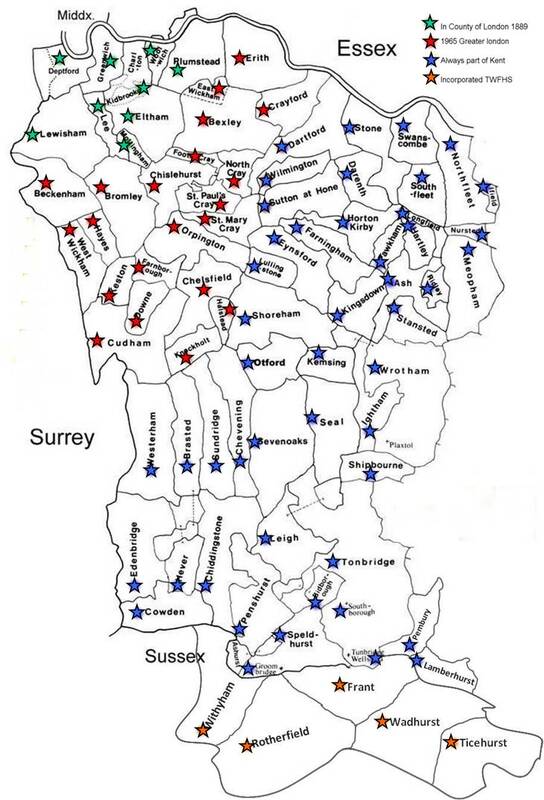 In 1991 the Tunbridge Wells FHS was established, covering the parishes overlapping the Kent and Sussex border around the town of Tunbridge Wells - the extreme southern point of the map. Following the demise of TWFHS in December 2016 we incorporated their area into NWKFHS. Enquiries to our Secretary which appear to be more properly dealt with by one of our neighbouring Societies are referred to them.